Although the above stocks are not worth discussing about but the modus operandi to fool retail investors or speculators makes it all the more interesting. As i have suggested before i dont like writing on manipulations as its not profitable but in one sense its a good eye-opener for readers. In the same post had mentioned about Vishal Info which dropped 50% the next week …… The worst part is you cant make money out of them but yes it serves the purpose of educating the readers. 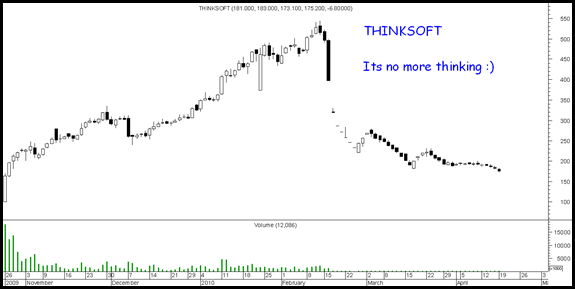 My warning for Thinksoft had come in around February 8th in the post Some Market buzz . The stock price was 500 which after went to 540 and collapsed to 220. Check the chart below to see what has happened. Later i had buzzed the yahoo list about Texmo pipes and explained in detail what could happen with newlisting stocks - New IPO stocks – You can make lot of Money or Lose lot of Money a must read link. The stock has since moved from 130 to 75 … Though the high was 160. The next stock in radar seems to be Aqua Logistics and Persistent Systems. - > The initial IPO price band was 220-230 which was later revised to 200-225. Finally the IPO price is 220. - > The company had to extend the issue by 3 days. - > Total subscription was 1.94 times. But the subscription by institutional investors was only 0.25 times !! Still the company is quoting at a price of 330 today. The modus operandi is set ----- Hope we dont get SMS buy calls. The stock can be soon dumped to investors with some flash moves ahead. Take CARE ! 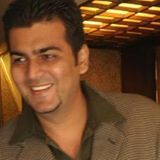 One of the well known IT companies with good brand recognition. With a total subscription of 94 times !! at the price of Rs 310 the stock is quoting at 390. A similarly nice issue like ARSS infra has moved from the issue price of 450 to 1200 !! Simple reasoning which is not technical tells me Persistent could be a good buy at current levels and on dips till 340. 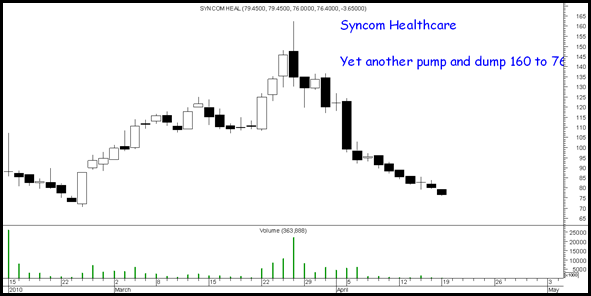 The stock could catch up momentum and target 500-600 in medium to long term. Again do your own research as i can go totally wrong 🙂 !! It takes a lot of time to write such posts. So i would request readers to pass this e-mail to as many of their friends, tweet it , share it on facebook,orkut, pass it on yahoo messenger. Hope reading this helps readers to not get dumped by some operator stocks as well as help their friends avoid it.